This week marks the 80th anniversary of Lee Falk's Phantom. I've talked before how I think it's a fantastic concept, but one I've never been able to really connect with. Since it's his anniversary, I figure it's a good time to give it another shot. That's all well and good, but how about some actual Phantom adventures? Maybe if I get something closer to the original pulp roots. How about the 1943 Columbia serials? This version stars Tom Tyler in the lead role. Tyler is probably better known today from his title role in Republic's The Adventures of Captain Marvel serial from 1941. Maybe in the other direction: The Phantom 2040... The Phantom here is voiced by Scott Valentine, more famous for his role as Mallory's boyfriend Nick on Family Ties. The show also featured the vocal talents of Margot Kidder, Mark Hamill, Paul Williams, and Debbie Harry among others. You might recognize the character design style here; the updated designs were by Peter Chung, creator of Æon Flux. I don't know, though. I still just can't seem to get into it. Can somebody point me to some Phantom material that's really going to hook me? It's a character I've really wanted to enjoy, but I just can't find a version that compels me. Have you seen the Billy Zane movie? It's widely ridiculed, but I don't understand that response at all. I love that film as a fun, adventure romp. It's What If Indiana Jones was a Superhero? On the comics side, I still have the recent Phantom series by Brian Clevinger and Brent Schoonover on my To Read pile, but I love both of those creators and expect that they came up with a great version. I did see the Zane movie. It was decent, certainly better than it's usually credited, but I couldn't get into it. But that was mostly because I don't especially care for Zeta-Jones. I do like Clevinger's work. I didn't know he'd written any Phantom stories; I may have to look those up! Thanks! 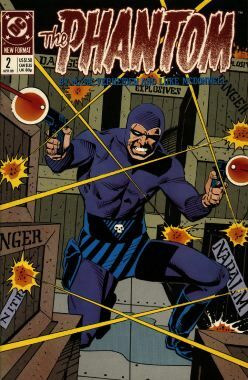 I would read the Sunday pages when I was a kid, but the comic that really got me into the Phantom were the Mark Verheiden/Luke McDonnell ones from DC a while back.